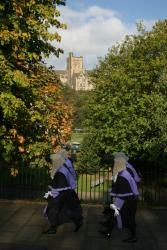 A legal convocation at Bangor Cathedral marked the start of Law as a subject at Bangor University.Over 150 Bangor University alumni and former staff will attend a special celebration next week to mark the tenth anniversary of the establishment of Bangor Law School. Since its inception in 2004, Bangor University Law School has soared through the league tables to become the foremost law school in Wales, according to the latest university rankings published by The Guardian. Now ranked 32nd in the UK, many of its alumni have gone on to successful careers as barristers and solicitors with prestigious firms and chambers, with its graduates also being sought by employers in non-legal sectors. Professor Dermot Cahill, Head of School, attributes this success to the small class sizes. “The Law School's focus on developing commercial awareness, and the vast network accessible to Bangor alumni via the extensive contacts developed by our staff, are key to our graduates’ success. The School’s ranking as no. 1 in Wales and 13th in the UK in the most recent National Student Survey bears this out, as does its high employability rating in the 90s, which, compared to a sector average of 62%, puts it near the top of the employability stakes among British law schools. 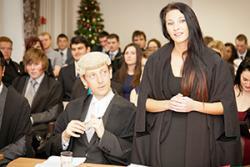 Law student Laura Delaney makes her case in a ‘Moot Court’ session in 2013.Its annual Law Fair now attracts top Law firms and chambers seeking to hire Bangor graduates, and major political parties in London and Cardiff seek out its academics for strategic advice in areas such as public procurement law and strategy. Some Bangor alumni have even established their own law firms, whilst others have remained within academia, pursuing PhD degrees or LLMs from the School's extensive offering of specialist programmes such as Public Procurement Law and International Criminal Law. Significant milestones in the School’s history include becoming the first Welsh institution to compete at the Telders International Law Moot Court Competition and to be invited to moot before the Supreme Court in London. Last year, it celebrated the opening of a dedicated moot courtroom by the Lord Chief Justice of England and Wales, and in 2014 and 2015 members of academic staff reached the UK finals of Oxford University Press’s ‘Law Teacher of the Year’ awards, demonstrating excellence in Law teaching. These achievements and many others will be celebrated at a spectacular two-day event held in Bangor University on 31st July and 1st August, which will be attended by staff and students past and present. 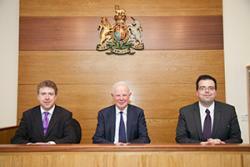 left-right: Dermot Cahill (Head of the School of Law), Lord Chief Justice of England & Wales, Lord Thomas of Cwmgiedd; Stephen Clear (Law School). The celebrations include a barbeque, a networking reception, panel discussions and a football match between staff and students. The weekend will culminate with a spectacular black tie dinner attended by Professor John Hughes, Vice-Chancellor of Bangor University, key judicial figures, musicians and other special guests, including Shaun Wallace, Senior Barrister at Great James Street Chambers and star of ITV’s ‘The Chase’. A criminal defence advocate of 25 years, Shaun has vast experience across a wide range of serious criminal cases, from murder – in particular Operation Trident cases, where he is highly regarded – to manslaughter, serious sexual offences, fraud, money laundering, firearms and drug trafficking. He is now also famously known as a television personality, having won BBC's ‘Mastermind’ in 2004 and appeared in ‘Eggheads’, ‘15-1’, ‘The Weakest Link’ and ‘The Chase’, on which he is currently appearing as a ‘Chaser’. He has presented programmes on Radio 4 and is a regular contributor on Radio 5 Live.